Healthy World Pet Deodorizer neutralizes ammonia in your pet's urine to keep your pet's world, and yours, smelling clean and fresh! “Powered by Sweet PDZ” means a lot, when we describe our Healthy World Pet Deodorizer. Here’s the reason why. Since 1984 the all-natural granules that are Healthy World Pet Deodorizer have been keeping horse stalls and livestock barns safe, healthy and ammonia free under the brand name, Sweet PDZ Horse Stall Refresher. Sweet PDZ has been the #1 stall deodorizer for well over two decades. It has extremely loyal customers, and is recognized as the best of the best. Through the years pet owners have been calling for a "pet deodorizer" package and size just for their little critters. 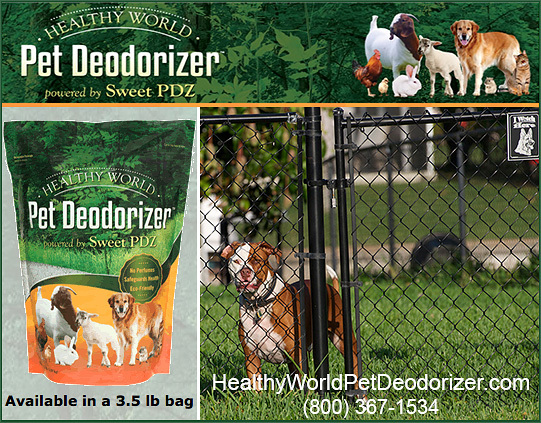 Their patience has been rewarded, as we finally introduce - Healthy World Pet Deodorizer powered by Sweet PDZ. Reader's Digest Version - When your pet conducts their “elimination” habits (the nice way to say, “urinates”), ammonia and odors are produced. These odors are offensive at best and harmful to their respiratory system, at worst. Healthy World Pet Deodorizer neutralizes ammonia through its unique mineral functions. Every pet creates odors, even if the household may not notice them anymore, guests will. Even unnoticed odors can affect the health of both animals and the people that love them. You’ll need a tissue for this story, and not just because the reference to ammonia will bring tears to your eyes. Ammonia is essentially a byproduct of urine breaking down/decomposing. Every creature walking our planet, no matter how cool they look or act, is guilty of producing ammonia and generally lots of it. Ammonia smells bad, but the odor can get especially offensive and become an unhealthy problem as time goes by (that's why us humans are encouraged to flush the toilet). We should also point out that the degree and range of ammonia and odor produced by a pet can run the gamut. In other words, some are worse than others. This story continues with you facing off to ammonia developing in your pet habitat, where it starts to reek really badly and begins to expose your pets to upper respiratory problems. Not to worry. That’s why you’re here to learn how Healthy World can solve your ammonia problem. How And Why Does Healthy World Pet Deodorizer Work? Unique Mineral Functions – Indeed the key reason as to why Healthy World works so good in capturing and neutralizing odors is due to its superior and unique mineral functions. They are known as, Adsorption and Cation Exchange Capacity. We won't overload you with geology and science so we'll summarize these mineral functions this way – These two mineral characteristics essentially work at capturing the ammonia and odor gases, change their chemistry, hold them and then neutralize them. No irritating perfumes or chemical cover-ups are involved or needed. Healthy World also works quicker and more thoroughly than enzyme products. At the end of the day, we can honestly call Healthy World an all-natural, safe, holistic and dare we say, organic, solution to pet odor problems. Clean Ingredient – Healthy World's only ingredient is a pure and natural premium grade Sweet PDZ Clinoptilolite mineral. Say, what? Simply put, it is a natural earth mineral. There is NO un-natural stuff (polite way of saying, chemicals, etc.) added. This means, no perfumes, masking scents, or colors. It’s simply a great product of Mother Earth. Mean Protection - Mean, as in we take no odor prisoners. Healthy World captures, neutralizes and removes harmful levels of ammonia, anyplace, anywhere. After all, ammonia is a noxious and harmful odor no matter if it’s produced by an elephant or a mouse. Eeeekk! Green for our Earth - We like to describe Healthy World as a "full circle" earth product. That is, we simply borrow the mineral from our Earth, allow your pets to load it up with urine, ammonia and waste odors, and then you return it to the good earth where it enhances your soil, gardens and compost. Our Mantra - If you smell ammonia and odors in your pet habitat, you have more than an odor problem; you have a health problem. See, we like to keep things simple here. So How Do I Use Healthy World Pet Deodorizer? On your initial application sprinkle a thorough and visible layer of Healthy World Pet Deodorizer on the floor of your pet habitat or litter box/tray. Then add your preferred bedding, if you choose. A daily or semi-weekly application is suggested to keep harmful odors from accumulating. When you clean out your litter box, tray, pen or kennel, simply repeat this application or apply as needed to remove noxious odors. While "deodorizer" is the popular description for our type of products, we never really liked its connotation, as it makes us think there is some sort of cover-up going on. "Neutralizer" is more our style, so to put our own distinct spin on the two descriptions we created DeoNeutralizer. So Where Can I Buy Healthy World Pet Deodorizer? Healthy World Pet Deodorizer is finding it's way into new dealers every day. From Farm Supply Stores, Pet Supply Retailers, and Online Merchants. We have thousands of Sweet PDZ Horse Stall Refresher retailers throughout the U.S. All of these retailers will now be selling our selling our Healthy World Pet Deodorizer. Available at Manna Pro nationwide: Manna Pro Products is Sweet PDZ's nationwide distribution and distributing partner. Sweet PDZ and Healthy World products are available wherever Manna Pro Products are sold. Please visit mannapro.com and utilize their Dealer Locator Tool on their homepage to find a dealer near you.